It was just mainly like Yuuki walking around the school with the night class students protecting her and Aidou mentions how her life could be in danger otherwise she wouldn’t need to be protected. She faints during class though so she ends up going to the infirmary and Ichiru tries to put some vampire blood in her but gets caught by Aidou who gives it to Kaname who breaks it. Kaname and Yuuki then have like a little tea time thing whilst Zero stands about. Kaname tries to get close to Yuuki but even though she likes it she tries to prevent it. She mentions how it seems this peaceful scene won’t last long. The episode then ends after the Chairman tries to cook a meal for Zero, Ichiru and Yuuki with Ichiru telling the Chairman that Zero likes vegetable soup. However, Zero hears Ichiru was trying to do something to Yuuki when she was in the infirmary and gets angry at him forcing Ichiru to leave. 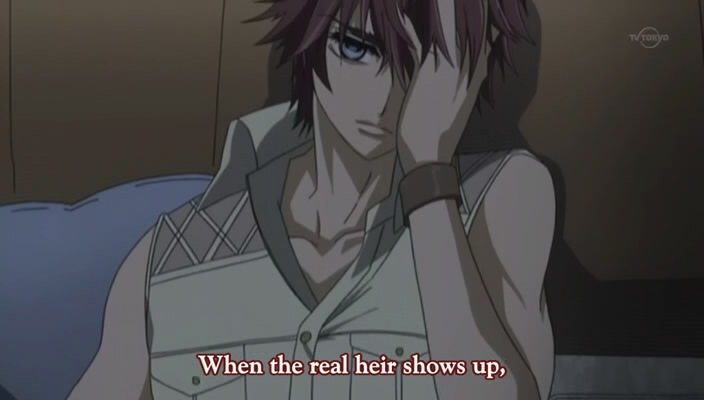 They then meet up again before the episode ends with Senri (now possessed by his father) returning to the dorm. This entry was posted on November 23, 2008 at 12:30 am and is filed under Anime, Vampire Knight Guilty with tags 6, Anime, Vampire Knight Guilty. You can follow any responses to this entry through the RSS 2.0 feed. You can leave a response, or trackback from your own site.